Cowboy wrestling made their Big 12 tournament debut this past weekend in Kansas City and the Pokes did not go quietly. The Cowboys are competing in their first year in the Big12 after the Western Wrestling Conference and the Big 12 merged in the offseason to form a 10 team conference. The expanded conference gives the Cowboys a better opportunity to send wrestlers to the NCAA tournament. More automatic bids are available for wrestlers, whereas in the WWC typically only the top finisher and a handful of wildcards were selected to move on. Oklahoma State, the class of the conference, ran away with the tournament and left a dog fight in their wake for the remaining places. Three Cowboys earned spots in the NCAA tournament. Tanner Harms, Bryce Meredith, and Drew Templeman are guaranteed spots in the tournament. Other Cowboys will have to wait and see if they will be selected as at-large candidates. Harms was the lone Cowboy to wrestle in the finals. He was defeated 6-3 by Austin Marsden of Oklahoma State. 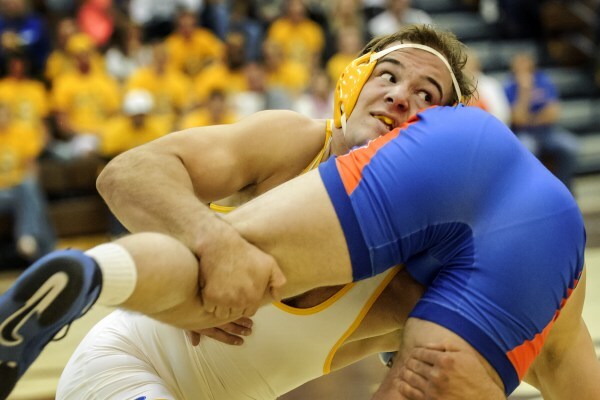 Harms will be making his second appearance in the NCAA tournament. Bryce Meredith earned third place. He finished the tournament in style by pinning his consolation finals opponent in 28 seconds. It was the fastest pin recorded by a Cowboy this season. He will be making his NCAA tournament debut. Drew Templeman finished fourth at 125 pounds. He was beaten by Josh Rodriguez of North Dakota State in the consolation final. Templeman will be making his NCAA tournament debut. Cowboys who could be at-large selections are Archie Colgan, who finished the season at 20-10 and 5th in the Big 12 tournament. Ben Stroh could also be a candidate for an at-large selection, finished the season at 18-14 and a fifth place Big 12 tournament finish. The NCAA tournament will be held March 17-19 at Madison Square Garden in New York City.